As the College of Southern Nevada’s 2014 graduating class takes its commencement walk May 19, the students achieve their individual goals and the College achieves a larger national goal. “There has been a dramatic nationwide push to college completion in America,” said James McCoy, CSN’s associate vice president of academic affairs. In 2009 President Barack Obama set a goal for the nation’s higher-education institutions to graduate eight million more students by 2020. Colleges like CSN are to graduate five million. With the new goal to reach, CSN became part of Achieving the Dream. Achieving the Dream is a national-reform network dedicated to community colleges to assist in identifying and implementing student success measures. The goal is to help students accomplish their degrees and do it in a timely manner. According to Achieving the Dream’s website, nearly one-half of all students seeking higher education in America choose a community college; however, fewer than half of those students actually finish what they started. McCoy is all too familiar with this discouraging statistic. He explains that more and more students are either dropping out of college or not attending at all. This makes Americans less competitive on the global stage. According to McCoy, it was just decades ago that the United States was leading the world in education; now the country’s ranking is No. 10 in the world. Despite this statistic, many CSN students continue to make graduation a high priority. 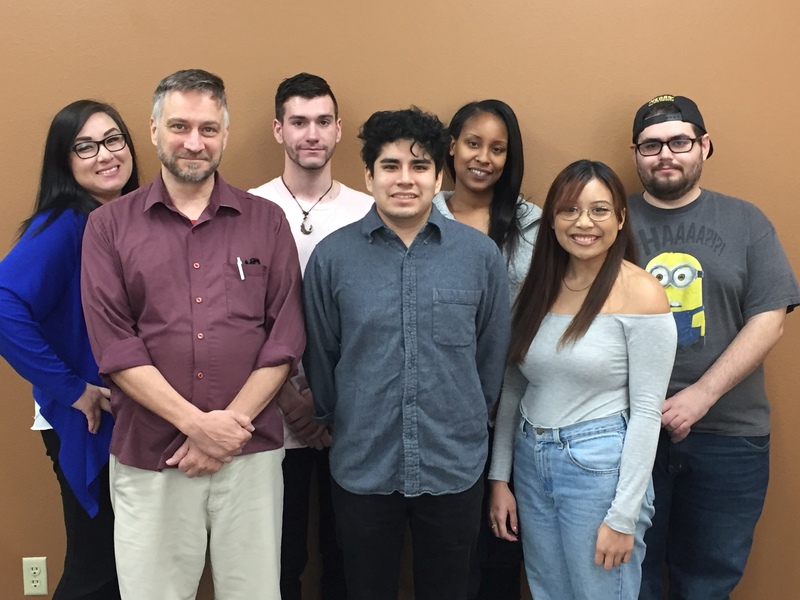 This year alone 1,610 students will make up CSN’s graduating class according to Hyla Winters, CSN’s associate vice president of academic affairs. Of these students 14 will receive bachelor’s degrees. McCoy has the unique experience of participating in CSN’s commencement ceremonies. He explains how administration and instructors celebrate the students’ achievements by wearing caps and gowns as well. “It creates this really formal yet exciting experience,” McCoy said. Each graduate has a moment to shine during the ceremony when he or she is captured up close on the big screen above the basketball court while receiving a diploma. 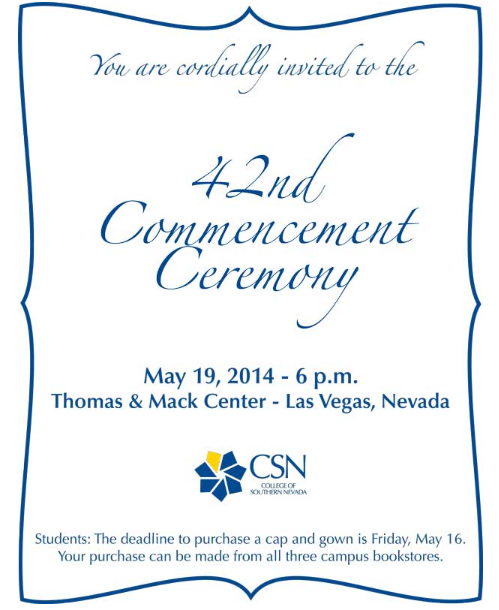 CSN’s 42 annual commencement ceremony will be held Monday, May 19, 2014 at Thomas & Mack Center at University of Nevada, Las Vegas.